Fasching is the southern German version of Mardi Gras, or Carnival week. 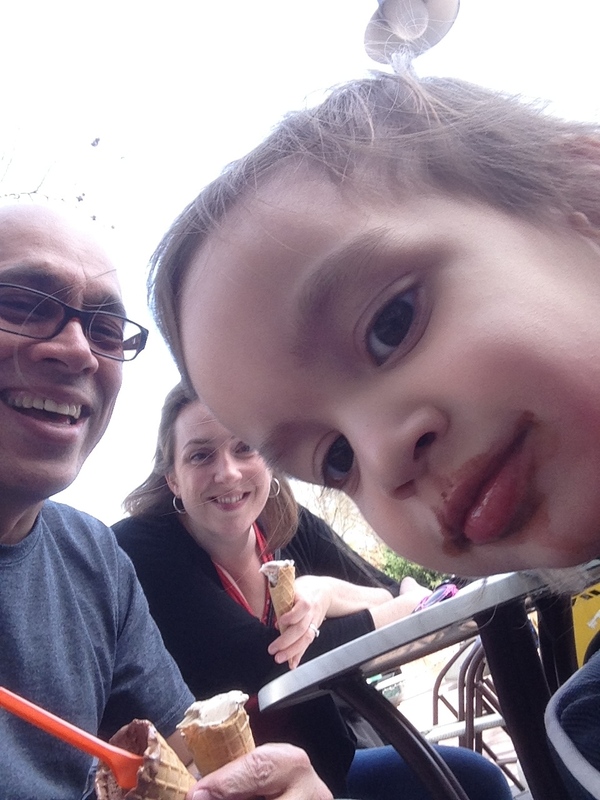 So, yeah, this post is four months overdue. 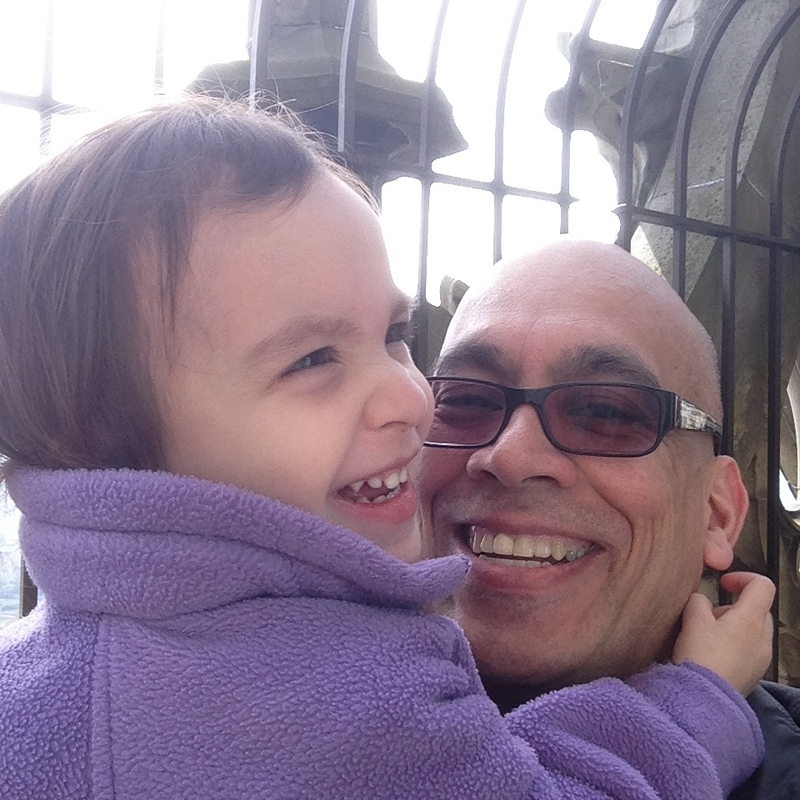 Late February was around the time that this blog fell off the rails for a bit. I was also discouraged in writing this post by the fact that I didn’t manage to capture as many good photographs as I’d hoped. But I want to write about our experience so that Sam and Lucy can someday read about it before all of our memories become hazy. Halloween was barely recognized in our part of Germany. I spotted a small section of costumes and decorations in the larger grocery stores, but we never witnessed any decorations in our neighborhood and we certainly didn’t see any trick-or-treaters on Halloween night. In Bavaria, they save all the costumes for Fasching. Fasching lasts all week, starting with the Thursday before Ash Wednesday. Stores start selling all sorts of costumes in the months leading up to the Carnival season. 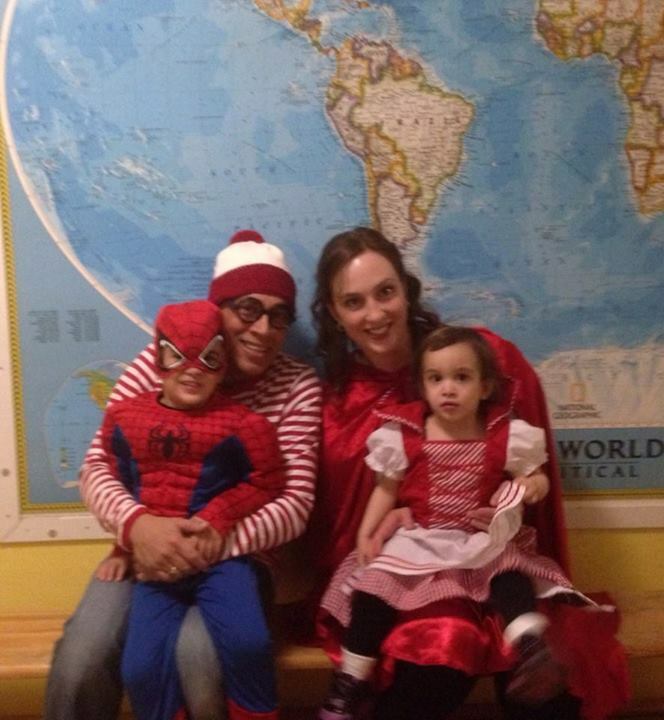 In America, for Halloween most children dress up as a character from a book, movie, or TV show that they love. Adults run into two camps, either risqué costumes for women that are not work appropriate, or comical costumes like giant bananas. Regardless of age, you will be asked “what are you?”. 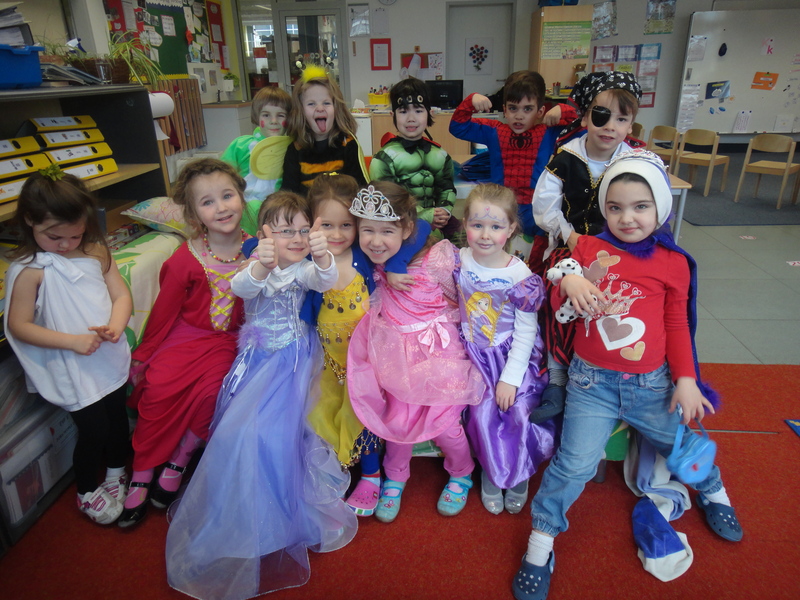 In Germany, lots of kids were superheroes, pirates, witches, or princesses. But for older tweens and teens, many choose to just wear a sort of crazy get-up, like a sparkly shirt with a colored wig. Grown-ups seemed to prefer to be cowboys or hippies. There are also a lot of plush animal costumes for all ages (probably to keep revelers warm when attending parades on cold February days!). Sam had wanted to be Spiderman all year. On the right, you can see one of the plush costumes I was describing. The other main difference between Fasching and Halloween is the lack of a focus on candy. Actually, that’s true of most of the holidays here. Valentine’s Day is more about giving notes of love to those you care about, not having to hand out lollipops to everyone in your class. Easter is about hiding real dyed eggs, not plastic eggs filled with candy. Yes, they had a lot of chocolate Easter bunnies, but in America we usually had the chocolate bunny, the jelly beans, the malted robin’s eggs…the list goes on and on. And Halloween was always the ultimate candy extravaganza. 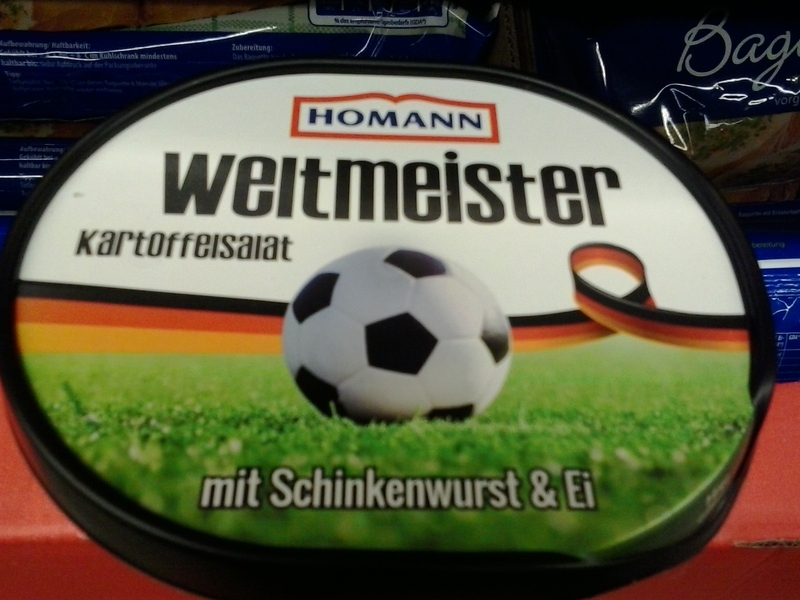 The irony is that American parents are often much more concerned about their kids’ sugar intake than German parents. Here, sweets are a daily experience, with apple strudels and chocolate croissants at every turn. In addition, from our very first week here we marveled at how our kids were handed candy by shop clerks at every errand we ran. My two kids now expect to be able to rummage in the candy drawer at the bakery and get lollipops handed to them by the waitresses as we leave a restaurant. McDonald’s Happy Meals come with gummies. 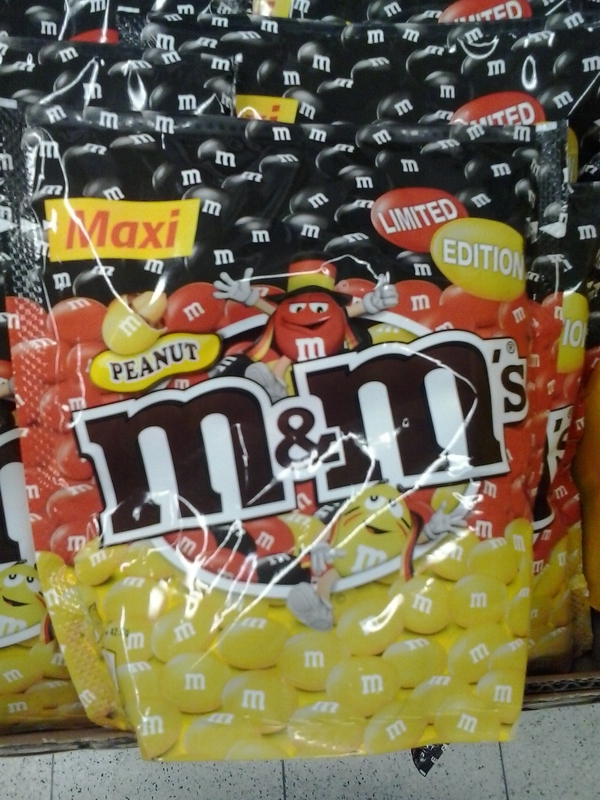 Even the pharmacist gives your medicine in a plastic bag filled with candy! It’s bizarre. But perhaps it’s not as much of a dietary problem for the simple fact that it isn’t restricted so they learn to self-regulate at a younger age. We actually managed to miss all of the Fasching parades in town. From the pictures we saw others post to Facebook, perhaps this was for the best, since the masked adults resembled ogres and monsters, and probably would have given our kids nightmares. I remember being scared by the vikings at Poulsbo’s Viking Fest parade myself as a youngster! 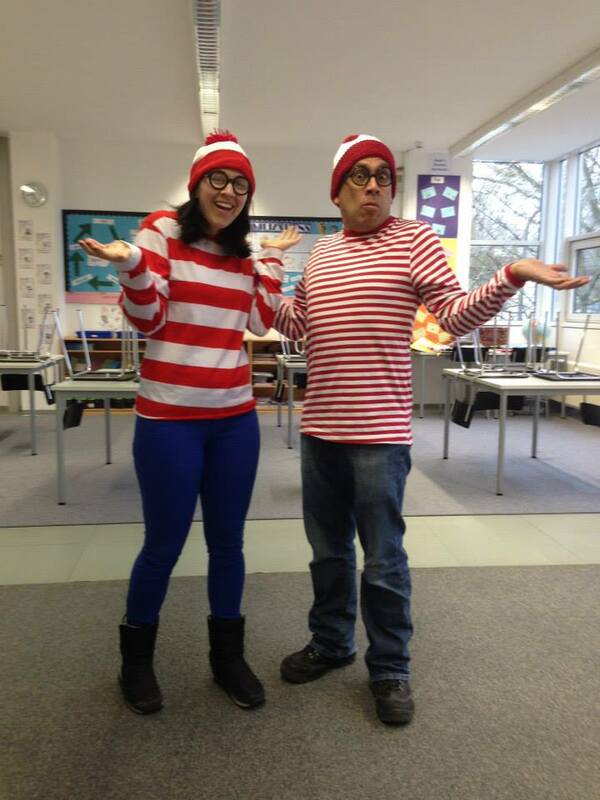 Joe and another teacher coordinated to both go as “Where’s Waldo?” (here in Germany, he’s known as Wally). 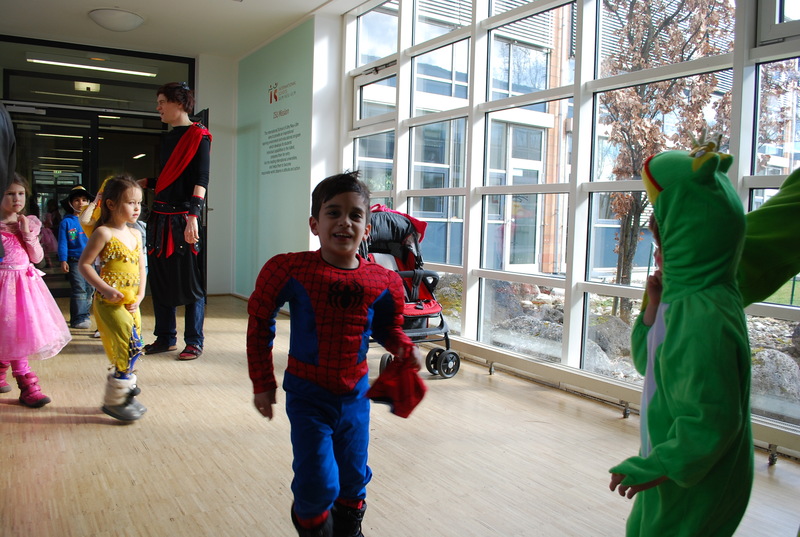 The school also hosted an evening Fasching dance party, which we attended before we had to leave to put the kids to bed. Lucy and I found matching Little Red Riding Hood costumes at the last minute. Lucy and Sam loved dancing to the music. And the best part is, we can recycle our costumes because Halloween’s only half a year away and they won’t have outgrown them yet! Earlier this spring, we finally did it! 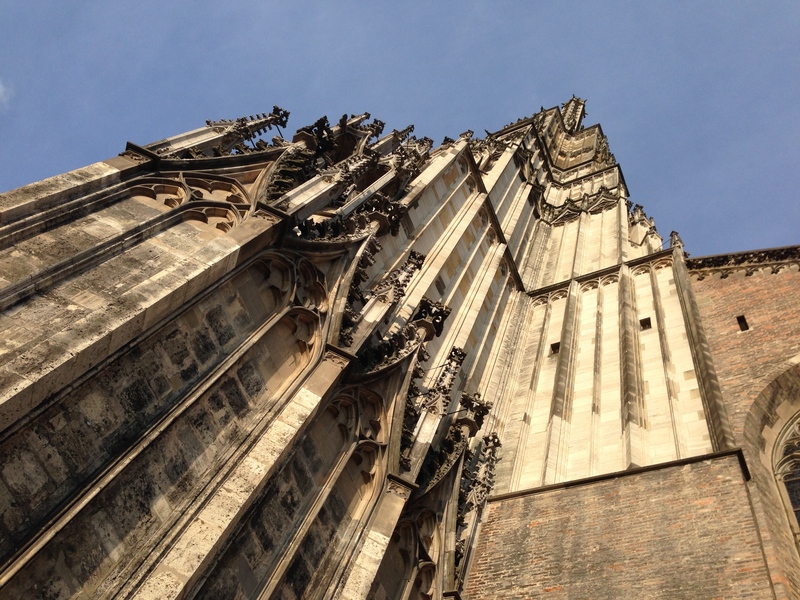 On a slow Sunday, with nothing else to do, we found ourselves in the town center and decided to attempt the Münster climb that we’d been meaning to do since we first moved to Ulm. 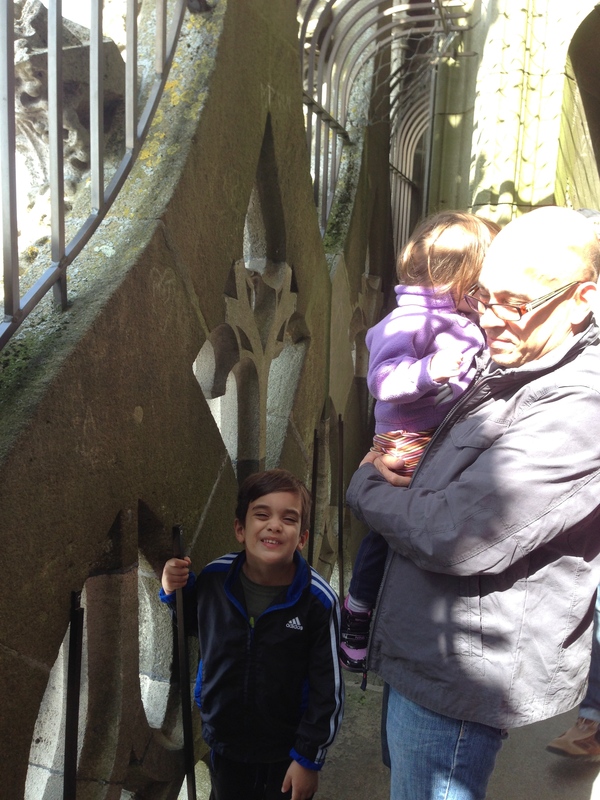 We paid our fee in the cathedral gift shop, then began to ascend the 768 steps. The view from the bottom. It’s a very tall tower! I didn’t manage many interior photos while we hiked. The entire climb is a narrow spiral staircase, and there were other tourists ahead of us and behind us at all times. Since we were carrying Lucy, and often Sam as well, we felt like we were already holding up the queue and didn’t want to stop for a photo on the stairs. 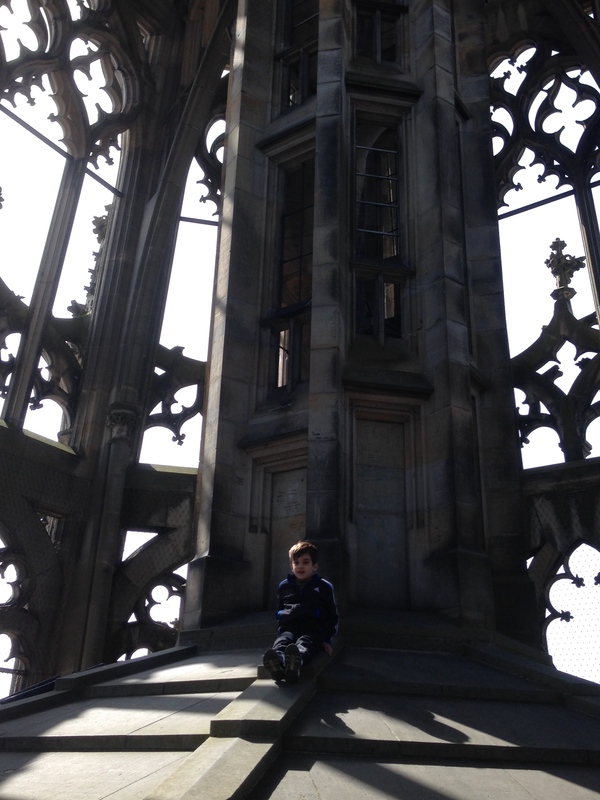 Plus, as anyone who’s visited European cathedrals before will know, the staircase is very dark and likely any pictures we tried to take wouldn’t have turned out very well. We made it to the first landing. 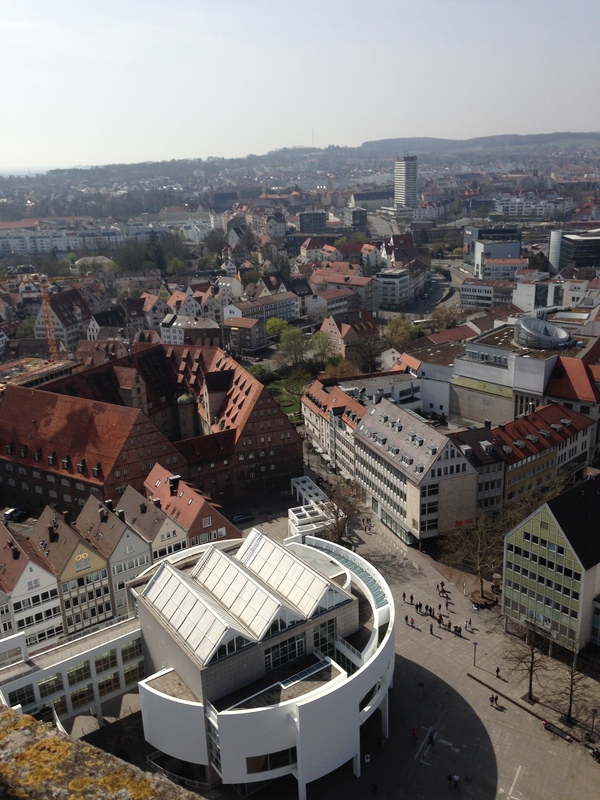 It provides a view of the Münsterplatz and the people strolling below. You can’t see it in this picture, but Joe and I were both already flushed & sweating! The view from the second landing. We were getting pretty high up! 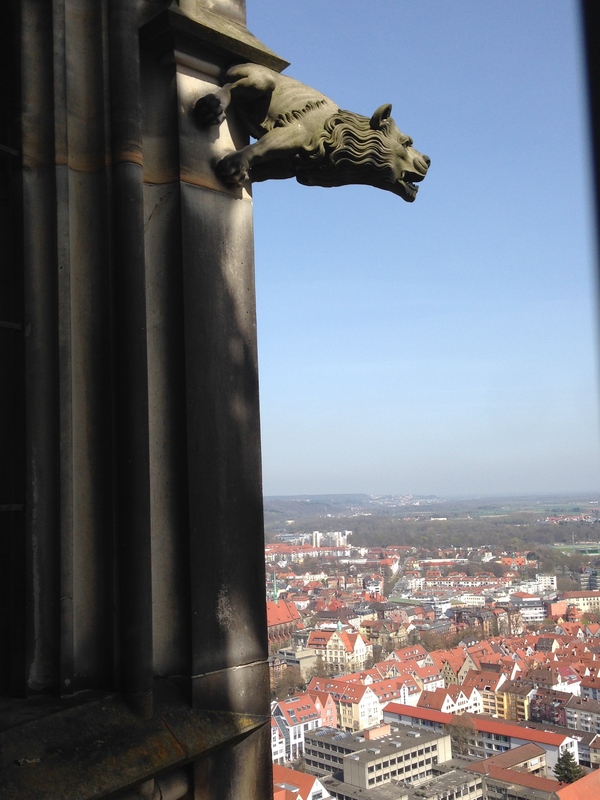 We also spotted some fierce-looking gargoyles en route. Most were on corners of the building that we couldn’t capture by our cameras. There was lots of caging at every opening, to prevent climbers from dropping things (or jumping) from such heights. The second landing also had a roof-top that became an impromptu slide for my kids. I truly believe this was their favorite part of the whole adventure! Happy kids. 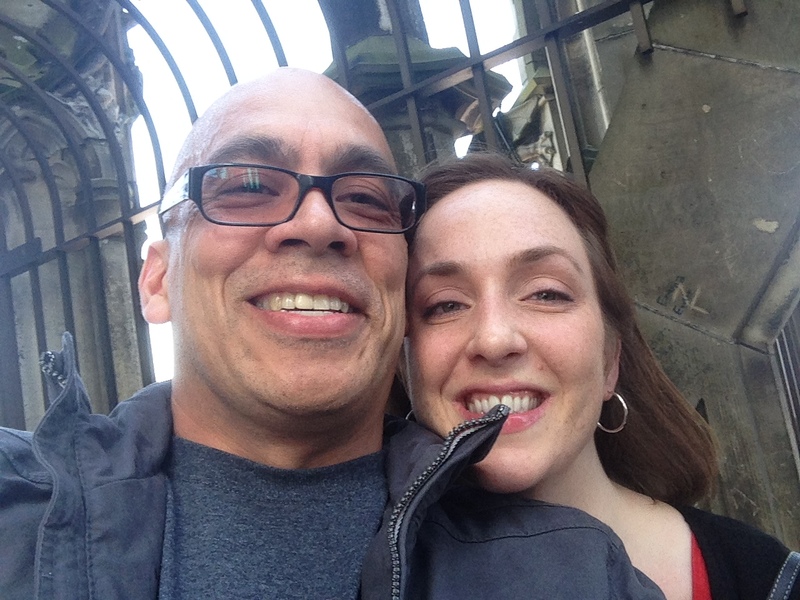 It’s a lot easier to be smiling when you’ve been carried by your parents up 500+ stairs. This is the final stairwell. 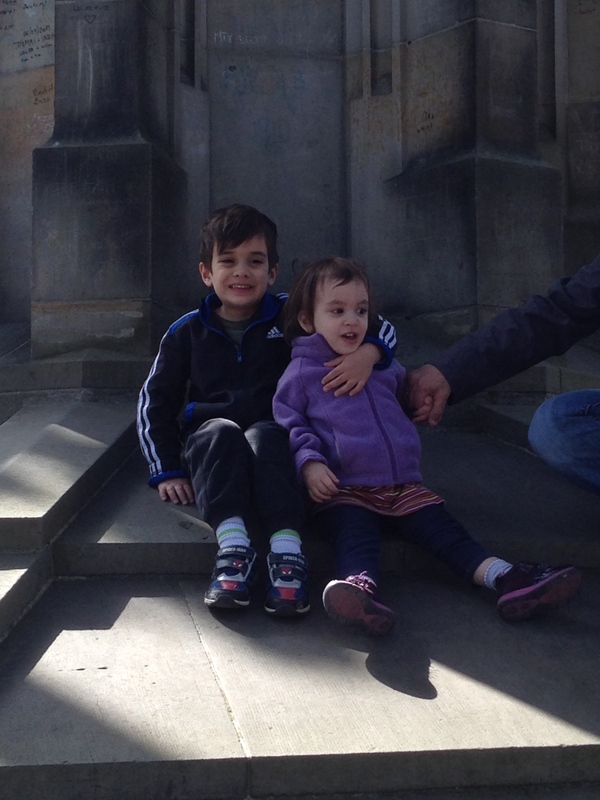 The Wikipedia page for the Münster accurately states that there is “barely enough room for one person.” And we had kids in our arms. Every time we had to pass someone going in the opposite direction, we had to hug the wall or the center column and hope that we would not lose our footing. Yikes! I think we were delirious by this point. Maybe it was the altitude? A quick snap of Sam on the final stairwell. At least half the tourists seemed to give up and not attempt this last climb, so we didn’t feel quite as much pressure to hurry. 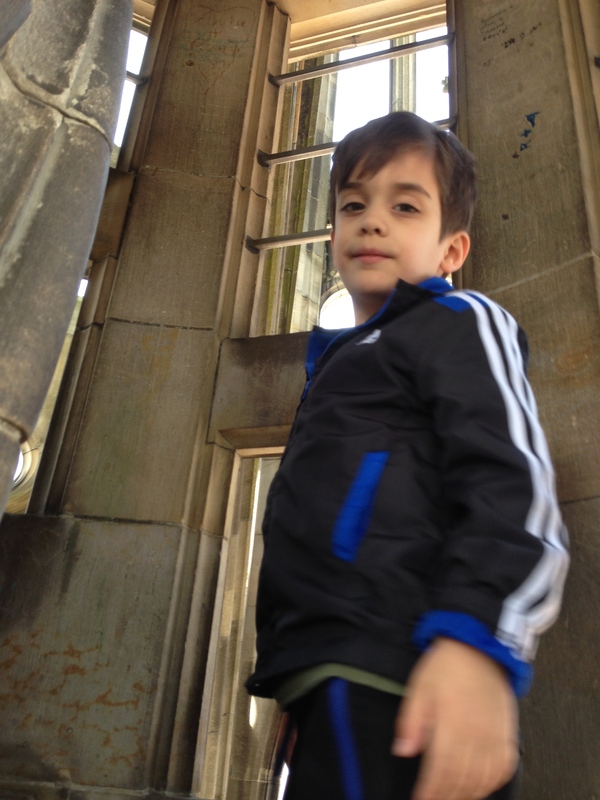 Sam actually did a very good job of climbing portions of the tower without [much] complaint. I think that living on the 5th floor of our apartment building has built up his tolerance more than we’d realized. 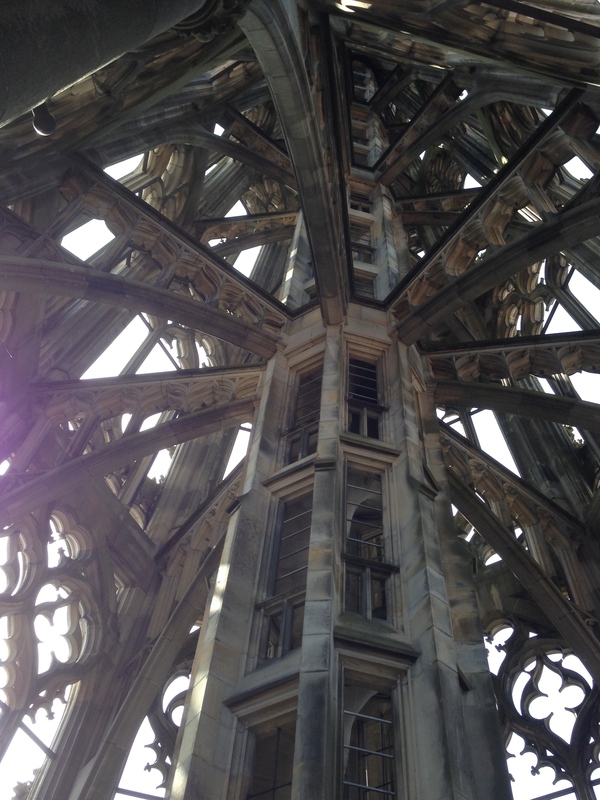 This is the roof of the main church below. And a view across the Danube. I don’t know what Lucy’s so grumpy about! You can see from the photo how narrow the circular walkway around the top viewing platform is. It was difficult to pass around other tourists. 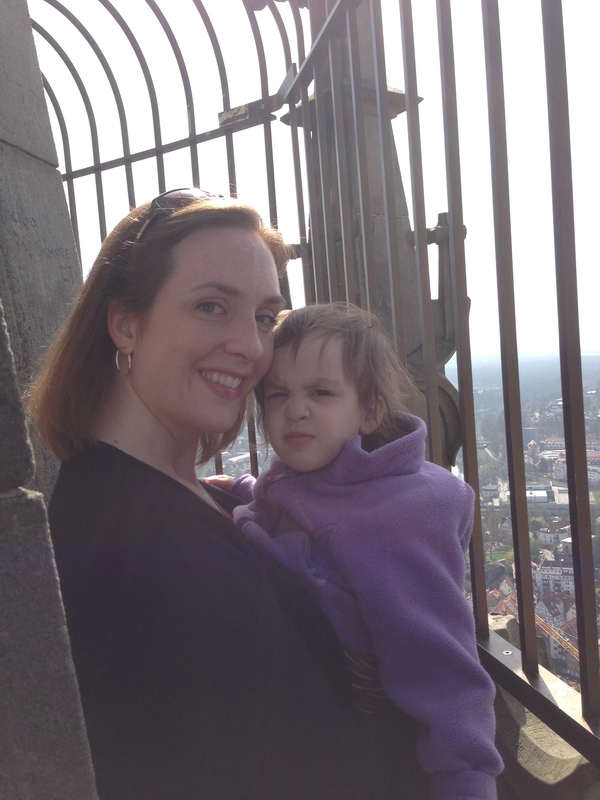 I wouldn’t recommend bringing young kids on the Münster climb, simply because of the cramped walkways. 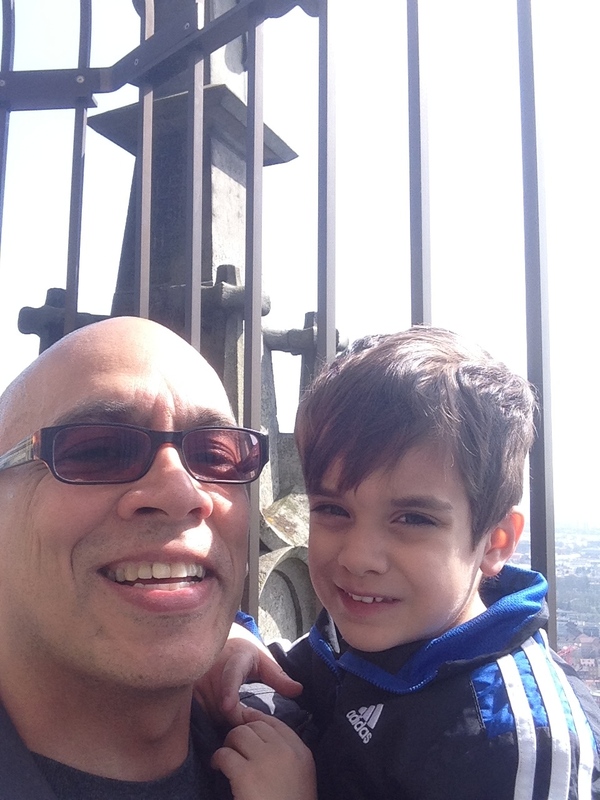 Here’s some selfies of Joe with the kids at the top. 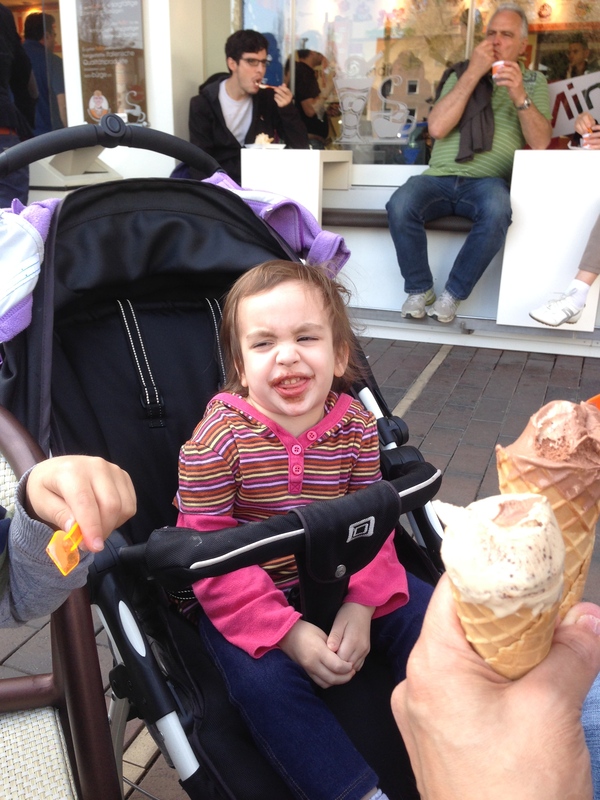 After all those stairs, we felt we deserved to reward ourselves with some gelato. Here’s a last photo taken by Sam. 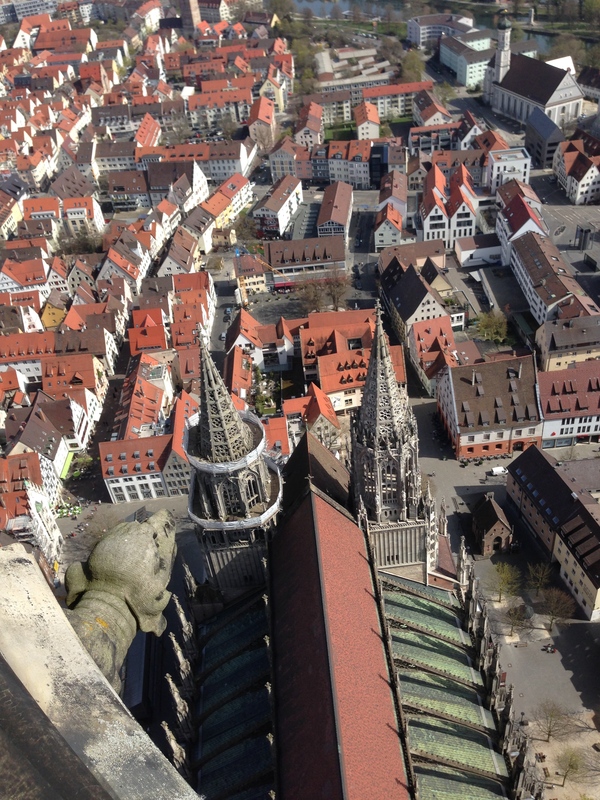 Kudos to all who have succeeded in climbing the Münster tower! 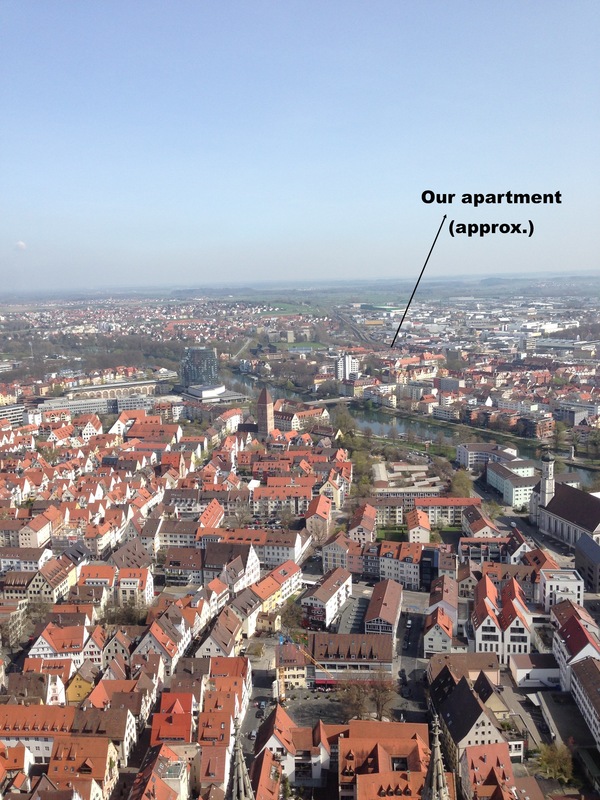 It’s not an easy feat and I’m glad we managed it once before we leave this German town. Hello to anyone still checking this stagnant blog! Apologies for the long blog hibernation. No excuses, I just fell off the technology wagon for various reasons and now I’m attempting to claw my way back into my old social media habits once again. I’ve never lived in a foreign country during World Cup season before. I knew that the rest of the world was passionate about the tournament in a way that we in America just never seemed to understand. I saw some coverage of the last World Cup, but mostly remember only the vuvuzela horns in South Africa more than which nations’ teams were in the top rankings. Well, all that’s changed. 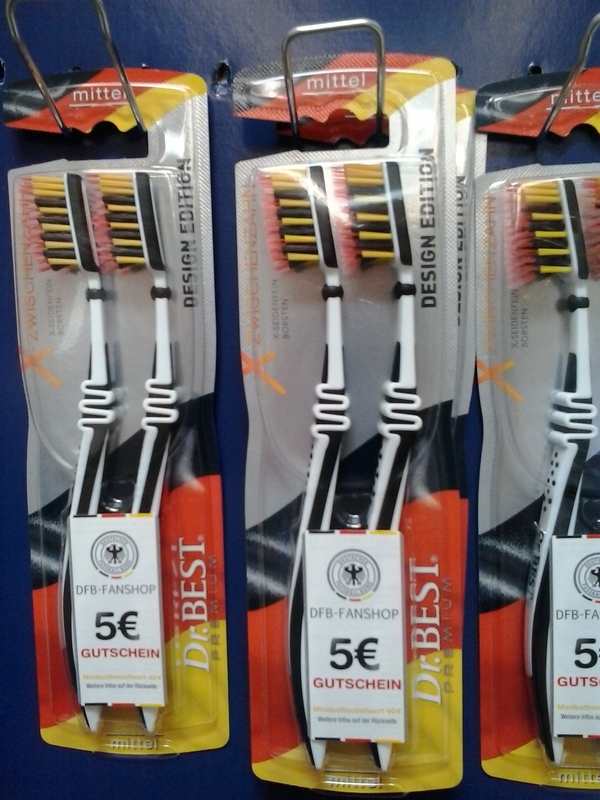 Here in Germany, there is supreme national pride visible everywhere, from the flags and streamers on the cars driving by to the lowliest products on supermarket shelves. I’ve never seen so much branding, not even for the Superbowl or the Olympics. Here’s a sampling of what I saw today while shopping for my family’s groceries. Yogurt with flavors for the top teams (Spanish orange, Italian panna cotta, German rhubarb, and Brazilian lime). Potato salad sporting a patriotic image. 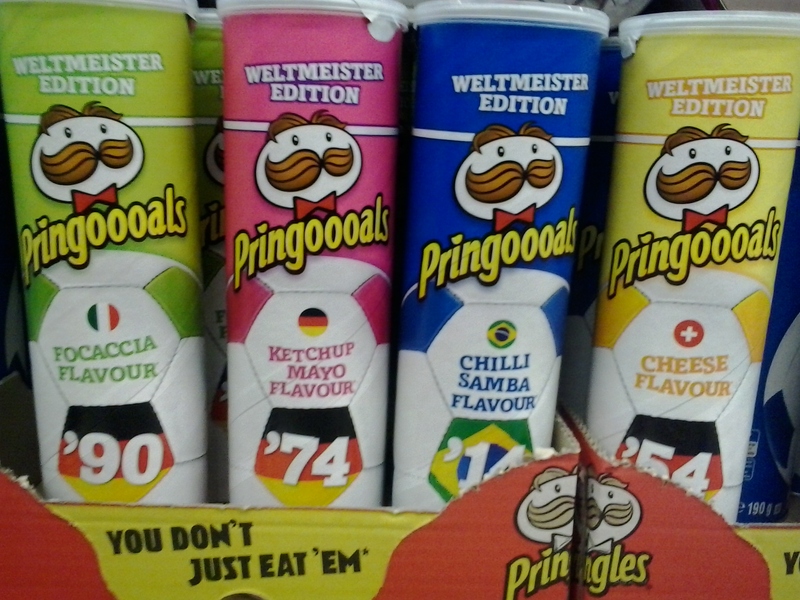 Pringles have jumped on the “themed flavors for different nationalities” bandwagon. 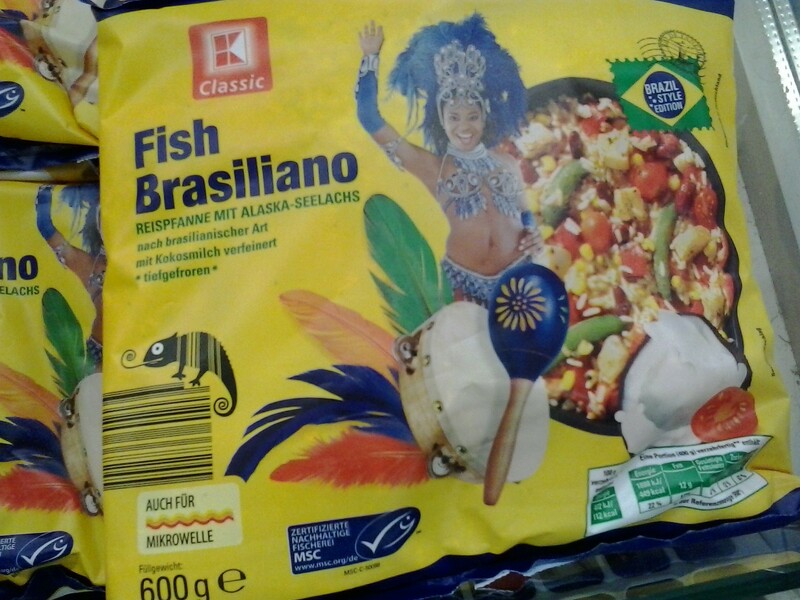 The frozen food aisle offers Brazilian-themed quick meals to serve at your World Cup party. 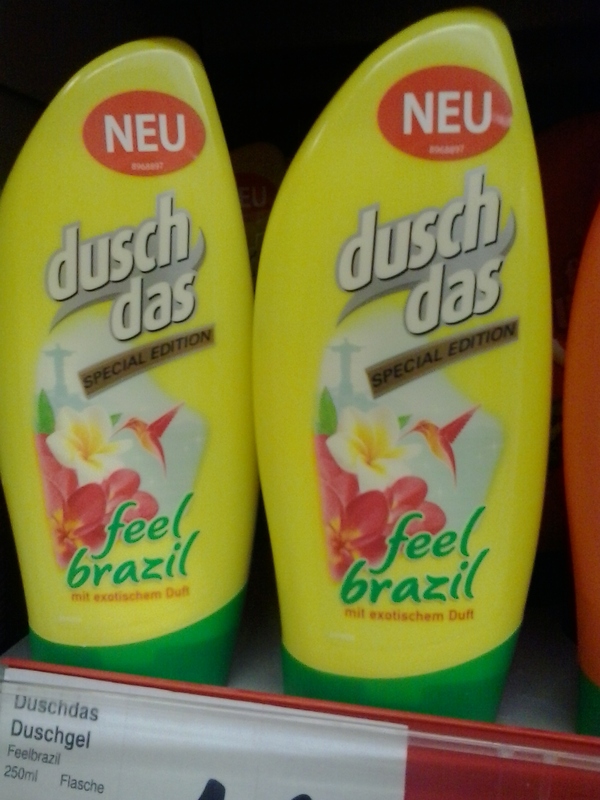 Brazilian-scented shower soap (whatever that means). 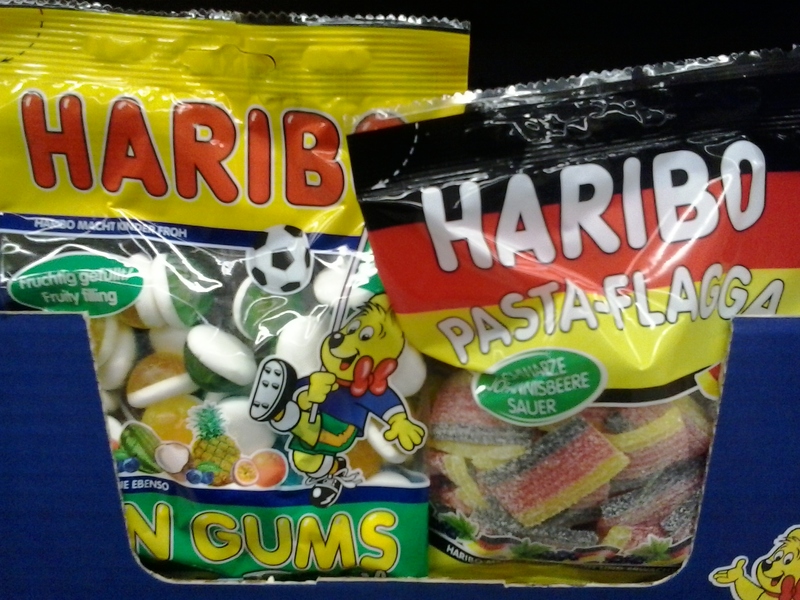 Tiny soccer ball gummies in tropical flavors (for Brazil) and sour gummy German flags. 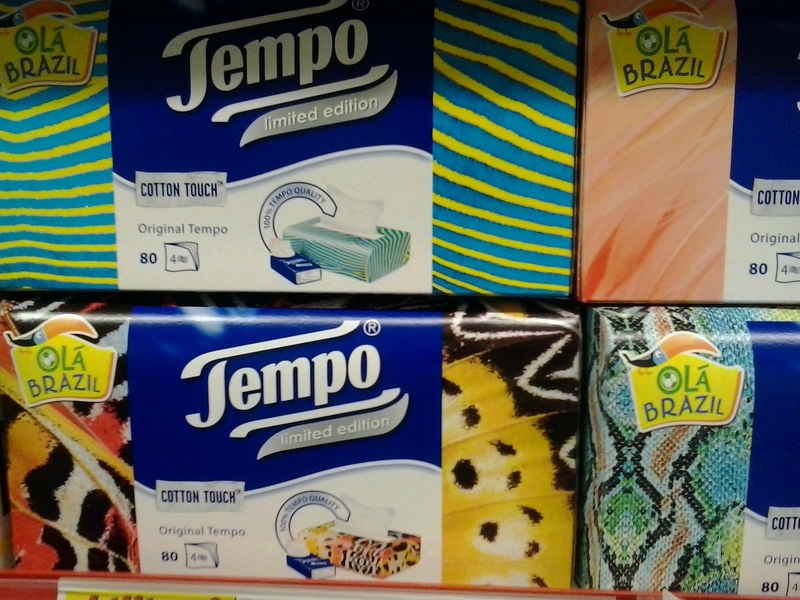 Tissue boxes must come in a Brazilian-print, obviously. And one’s candy dish must only sport M&Ms in patriotic colors. 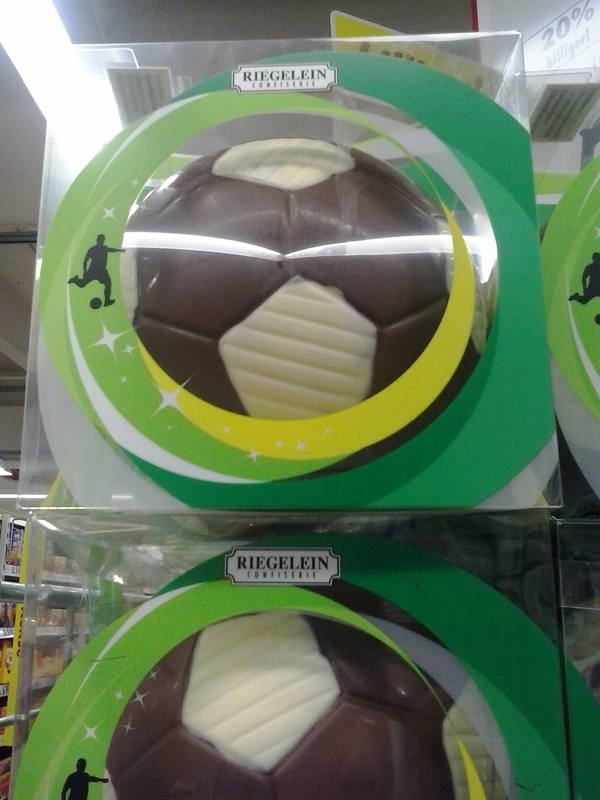 And last of all, a life-size soccer ball made out of chocolate. Because your kids ate the chocolate Easter bunny you gave them last month and now they need MORE sweets. It’s fun to discover what the marketing teams can come up with. And I’m very glad to have experienced the FIFA World Cup hoopla at least once in my life.